On 27th September, “Floral Whisper along the Silk Road—Culture Journey of Maritime Silk Road” marks a successful end in Cyprus. It is a global campaign to accelerate the cultural construction of 21st Century Maritime Silk Road on the occasion of the fifth anniversary of the “Belt and Road” Initiative. During the official event in the three countries, a Memorandum of Understanding on “Co-operation and Protection of the Maritime Silk Road Cultural Heritage and Sharing of Achievements” was signed which agreed that all parties will work together to uphold the cultural heritage protection of the Maritime Silk Road. The event has paved a road of friendship and cooperation for the cities along the route with the theme "One Exhibition, One Memorandum, One Performance". “On this basis, we will continue to write a new chapter in the development of the Maritime Silk Road," said Mr. Lu Zhiqiang at the launch event. The "Floral Whisper along the Silk Road" cultural performances including classic music of Guangdong, Cantonese Opera provided a magnificent gala to the local audience. The maritime silk road is a maritime passage connecting China and the world which appeared in 200 BC, leaving a lot of precious cultural heritage. As the “Millennium Business City” and one of the birthplaces of the ancient Maritime Silk Road, Guangzhou has a glorious history of global trade, civilization and mutual understanding for more than two thousand years. Guangzhou has developed and integrated diversified culture, forming an urban character of openness and inclusiveness. 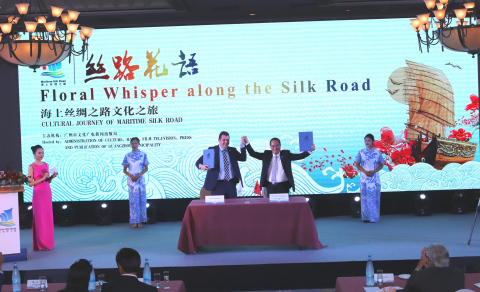 Taking the "Floral Whisper along the Silk Road" as an opportunity, Guangzhou is vigorously facilitating the circulation of cultural elements of the maritime silk road worldwide and further enhancing its international influence.